We, Trang Bricks Private Limited from 2018 are prominent manufacturers of high-quality Fly Ash Brick and Paver Block Making Machines. Offered products range consists of Fly Ash Brick Making Machine, Paver Block Making Machines, and Vibrating Table. Recognized for their long service life, simple usability, rugged design, smooth performance, and high efficiency, these products are made available in several technical specifications. Also, we provide these machines at reasonable prices and within the assured time frame. Since our inception, we have backed by an ultra-modern infrastructure. We have a team of talented professionals which work dedicatedly to provide a quality approved product which is in compliance with the client’s given specifications. Apart from this, all our offered fly ash brick and paver block making machines are quality assured against the industry set parameters to ensure their quality. Owing to our prompt delivery, competitive price structure, ethical business policies, and client & quality centric approach, we are constantly progressing in the industry. Our mentor Mr. Rahul Kumar has guided us to be able to reach such heights. His managerial skills and ability to make good decisions, has been our most valuable asset to grow rapidly. 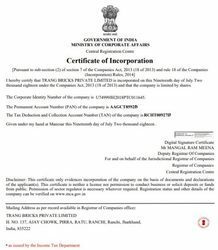 Trang Bricks Pvt. Ltd is a started with the sole purpose of providing quality and environment-friendly. Fly Ash bricks to be used in construction works in PAN India. Founder of this company was involved in traditional Red Bricks industries in PAN India since last decade. People connected with the Company had owned a few red bricks plant in past. But with changes in technology and increasing concerns about damage caused by the production of red bricks to our mother nature. We decided to take risk and initiative and set trends for others. we invested in green technology for the production of Bricks. Bricks produced by this technology is known as Fly Ash Bricks. Fly Bricks has much Quality which is far better and superior as compared to traditional red bricks. Fly ash bricks have at least three times more strength than red bricks. To know more about Quality please go to Why Fly Bricks. Come and Join Us in Saving our Environment. We have developed a high-end infrastructure. Installed with latest tools, our infrastructure is segregated into different departments like manufacturing, warehousing, packaging, quality control, and R&D. This segregation ensures smooth business operations and assists us in meeting the exact requirements of clients in an efficient manner. In addition to this, to manage these units, we have appointed a team of talented professionals. We, Trang Bricks Pvt Ltd are prominent Manufacturer of High-Quality Fly Ask Bricks & Machineries. Offered products range consists of Block Machine, Brick Machine, Gypsum Powder and Lime Stone. Recognized for their long service life, smooth functioning and high efficiency, these products are made available in several specifications. We are offering these products in customized options also as per the detailed requirements of our clients. Apart from this, all our offered machines are quality assured against the industry set parameters to ensure their quality. Our state-of-the-art infrastructure unit is loaded with contemporary technology and machines. This helps us to cater the bulk requirements of our prestigious patrons. Together with this, we have a team of talented professionals which work dedicatedly to provide our patrons with a quality approved product range which is in compliance with the client’s given specifications. Moreover, owing to our ethical business policy, we are well appreciated by our huge clientele group. Being a quality driven organization, we believe in offering our patrons the best quality fly ash brick and paver block making machines. All the ranges are quality checked, from designing till delivered at the client’s end. In adding, for this, we have established a huge in-house quality testing unit. Due to the assistance of our experienced and capable team members, we are instrumental in providing an extensive collection of products as per the set industry norms.